South Brunswick Police Chief Raymond Hayducka announced the arrest of a 31 year old woman who had been stealing from elderly residents of an assisted living facility. Kenisha Hollingsworth of New Brunswick was arrested for stealing credit cards from elderly residents who were staying at a Princeton address assisted living facility. The four month investigation by Detective Brady Shelcusky identified three victims but police believe there maybe more. “One victim was in his late 90’s, another victim was blind, so it wasn’t until their family members saw their credit card bills that they even realized there was a problem,” said Detective Shelcusky. The investigation uncovered that the suspect was using the credit on Lyft rides and hotel rooms. The suspect had access to all the residents’ room as she worked at the facility. 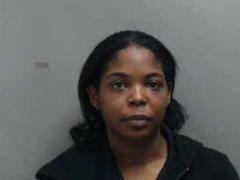 Police believe she stole the credit card numbers from the mail that was sent to the residents. Detective Shelcusky is continuing to investigate if other suspects were involved in the thefts. Hollingsworth was charged with 3 counts of credit card theft, theft of movable property, and fraud. She is charged with stealing on multiple occasions over the past four months. Police are unsure the exact amount of money stolen as victims wait for credit card bills to reveal the extent of the crime. Chief Hayducka said, “The people this suspect targeted are reliant on others for daily assistance and we will prosecute anyone who tries to take advantage of them. We will continue to follow leads and remind families to monitor older relatives’ finances to make sure no one exploits them”. Hollingsworth was charged and turned over to Englishtown Police. She had outstanding traffic warrants out of Englishtown, New Brunswick, South Brunswick in addition to the criminal charge. nyone with information about the case is asked to call Detective Shelcusky at (732) 329-4000 extension 7496. EACH DONOR WILL RECEIVE A VOUCHER FOR 2 NY METS TICKETS!